Jil Sander will launch Style Soft, the latest flanker to 2006's Jil Sander Style for Women fragrance, this coming February. Style Soft was developed by perfumer Bernard Ellena, and is intended to be a gentler, more transparent version of the original Style scent, with fruity notes replacing the spices. The notes include freesia, mandarin, blackcurrant, violet, magnolia, jasmine, vanilla, soft woods, vetiver and white musk. 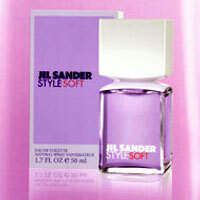 Jil Sander Style Soft will be available in 30, 50 and 75 ml Eau de Toilette. Other recent launches from Jil Sander: Style Summer, Style Pastels Blush Pink, Tender Green, Soft Yellow, Man Absolute. I'm with you, vanessa! I was hoping they'd maybe even come out with Style Intense, with less fruit, more spice and resins, and more “hard” edges to boot. Guess we're getting anything but soft in our old age. I'd take that version too! But Style is strong in terms of sillage, IIRC. Did either of you try Stylessence? I wish I remembered both of them better than I do, but I do remember that I liked Stylessence better. Less, fruit, more spice and resins… surely you're talking about Jil Sander's No. 4? I'm sorry to say that this is the only Jil Sander I've sniffed, R.
I've only tried a few myself — they're awfully hard to find here.